DECLARING THAT HIS red “MAGA” hat makes him “feel like Superman,” rapper Kanye West made a free-styling appearance in the Oval Office today. Ahead of a private lunch, US President Donald Trump and West spoke with reporters as they sat across from each other at the Resolute desk. West dominated the conversation with a series of monologues that touched on social policy, mental health, endorsement deals and his support for the president. West said that many people believe that, if you’re black, you have to be a Democrat and said he was pressured not to wear his red “Make America Great Again” hat. But he said, “this hat, it gives me power”. If he don’t look good, we don’t look good. During one pause in West’s comments, Trump said: “I tell you what that was pretty impressive.” He also described West as a “smart cookie”. 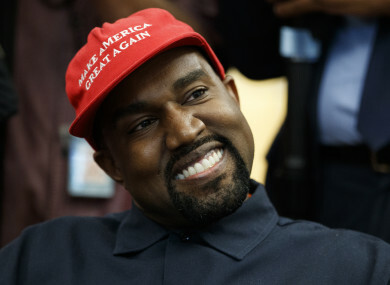 Email “Kanye West tells Trump his MAGA hat makes him 'feel like Superman' ”. Feedback on “Kanye West tells Trump his MAGA hat makes him 'feel like Superman' ”.